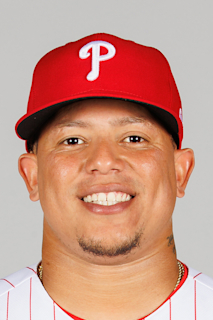 Name is pronounced JYE-row MOON-yos...Resides in Nagua, Dominican Republic with his wife, Yessica Ogando, and their son, Yairo Jr...His brother, Jairo (pronounced WHY-roe) Muñoz, was a right-handed pitcher in the Royals (2011-14), Phillies (201516), and Rays (2017) minor league systems...Enjoys fishing in the off-season. Made the Opening Day roster out of Spring Training and appeared in 108 games, T-9th among National League rookies...Started 72 games at a team-leading six different positions (SS-34, 2B-23, 3B-6, LF-1, CF-3, RF-5). • Was one of 26 Major League players in 2018 to appear defensively at six or more positions (three players appeared at eight positions and 12 players at seven positions)...Joined José Oquendo (1987), Possum Whitted (1913), and John Houseman (1897) as the only Browns/Cardinals in franchise history to appear defensively in three or more games at 2B, 3B, SS, LF, CF, and RF in a single season...Committed team-leading 18 errors (T3rd in NL), most by a Cardinals rookie since Albert Pujols (20) in 2001...Tied with Patrick Wisdom for 2nd on the Cardinals with five pinch hits (5-15, .333)...Ranked among National League rookies in batting (.276, 7th), RBI (42, T-7th), runs (39, 8th), hits (81, 10th), doubles (16, T-7th), walks (30, 7th), intentional walks (7, 2nd), on-base pct. (.350, 6th) and slugging pct. (.413, 8th)...Led the Cardinals and ranked 9th in the National League in two-strike batting average (.247, 39-158)...Did not go more than two consecutive starts without a hit or run all season...Batted .353 (42-119) with runners on base, the highest mark on the team, but did not qualify for league leaders...Went combined 8-for-13 (.615) with 2 HR, 5 RBI and a double off Max Scherzer, Clayton Kershaw, Madison Bumgarner, Zack Greinke and Corey Kluber, with home runs off of Scherzer (9/3 at WSH) and Bumgarner (7/8 at SF)...His seven intentional walks were the most by a Cardinals rookie since Pete Kozma (8) in 2013, and three shy of the club record of 10 by Mike Tyson in 1973...Started his first Major League game (3B) in the Cardinals Home Opener vs. Arizona (4/5)... Recorded his first MLB hit and home run at Miller Park with a 9th inning single off Oliver Drake (4/2) and a two-run home run off Brent Suter (5/28)...Tallied his first MLB extra base hit with a pinch-hit double at CIN (4/13)...Was the Cardinals first pinch hit for extra bases in 2018...Was optioned to Memphis (AAA) on 4/16 with Mike Mayers when Jedd Gyorko and Luke Gregerson were activated from the disabled list...Recalled (5/18) with Tyler O'Neill when Paul DeJong and Matt Bowman were placed on the 10-day DL...Went 4-for-4 vs. KC (5/21), the first Cardinals rookie with four hits in a game since Paul DeJong (7/8/17 vs. NYM) and the 8th instance an MLB rookie had 4 hits in 2018...Recorded his first career walk-off hit and home run vs. PIT (5/31), a three-run shot off Felipe Vázquez, tallying a season-high five RBI. He was the third Major League rookie with 5 RBI in a game in 2018 (Niko Goodrum, DET & Christian Villanueva, SD) and the first Cardinal since Stephen Piscotty (8/23/15 at SD)...Recorded a pair of 14-pitch plate appearances: 6/26 vs. CLE, a groundout against Dan Otero & 8/6 at MIA, a groundout against Tayvon Guerrero; T-2nd longest plate appearances behind Yadier Molina's 15-pitch plate appearance (4/29 vs. PIT), a single off Michael Feliz (Elias)...Hit game-tying homer (#4) at ARI (7/4) ending Yoshihisa Hirano's scoreless inning streak at 26 games...Missed 11 games (8/11-8/21) with a right wrist sprain suffered at Kansas City (8/10)...Played two-game rehab assignment with Springfield (8/18-8/19)...Batted .283 (28-93) with 3 HR and 13 RBI in 28 games between Memphis and Springfield, starting games at five different positions during his minor league tour (SS, 3B, 2B, LF, CF)...Hit grand slam at Oklahoma City (5/10) while with Memphis totaling his minor league single-game high of 4 RBI...Hit a pair of 7th inning HR's and went 3-for-5 with 4 RBI on 2/28 in 10-9 Spring Training win at Orioles. Batted .300 with 13 HR, 68 RBI and a career-high 22 stolen bases in 112 games between Midland (AA) and Nashville (AAA) ... Started at six different defensive positions over the season with the most at shortstop (46), followed by third base (36), centerfield (20), right field (5), left field (3) and second base (2) ... Established new career-highs in triples (4), while matching his highs in home runs (13), doubles (26) and sac flies (7) ... Posted a career-high 5 RBI at Omaha (7/18) going 3-for-5 with two doubles and a home run ... Was 18-for-35 (.514) from 8/24-9/1 hitting safely in all eight games with six multi-hit games ... Had three games with two stolen bases (6/3 at NW Arkansas, 6/10 vs. Frisco & 8/9 at Tacoma) ... Posted an RBI in five straight games (5/31-6/4) ... Scored a run in seven straight games (5/28-6/4) ... Played in five games for the Toros del Este in the Dominican Winter League. Batted .240 with nine home runs and 39 RBI in 102 games in his Double-A debut with Midland…walked just 23 times and matched his career low with a .286 on-base percentage…equaled his career high with three triples…was 6-for-13 (46.2%) in stolen base attempts…hit .313 (30-for-96) against left-handed pitchers compared to .216 (63-for-291) against right-handers…had a .219 batting average with four home runs in 34 games before the All-Star Break, .252 with five home runs in 68 games after the break…batted .246 with all nine of his home runs in 92 night games…hit .195 in 10 day games…connected for six of his nine home runs on the road…went 0-for-10 with one RBI the bases loaded…appeared in 41 games at shortstop, 27 at second base and 25 at third base…committed 12 errors as a shortstop (.937 fielding percentage), three as a second baseman (.979) and four as a third baseman (.956)…also batted .303 in nine games as the designated hitter…hit in every spot in the order except leadoff…saw his most action batting seventh where he had a .290 batting average in 28 games…began the season on the disabled list with a bruised right heel…was reinstated April 26 and hit safely in each of his first three games (4-for-11, .364)…went 3-for-4 with a double, two home runs and a season-high four RBI May 9 at Frisco…also homered the next day against the RoughRiders…then homered just once over his next 76 games…collected a season-high four hits May 14 at San Antonio and a four-game hitting streak from May 14 to 19 (7-for-16, .438) boosted his season batting average to .281…then went 13-for-81 (.160) over his next 20 games to fall to .214 on June 23…had his lone two-steal game of the season May 17 against Frisco and also walked a season-high three times…had a 17-game streak without an extra base hit from May 23 to June 23…went 10 consecutive games without a strikeout from July 9 to 19…had a season-high nine-game hitting streak from July 13 to 21 (13-for-33, .394), which boosted his average from .225 to .249…had a 23-game streak without a walk from July 17 to Aug. 12…went 2-for-32 (.063) over a nine-game stretch from Aug. 6 to 16…then hit .304 with four home runs and 10 RBI over his final 18 games…homered in back-to-back games a second time Aug. 30 and 31 against San Antonio…hit .387 (12-for-31) with seven runs scored, three doubles and four RBI in eight postseason games for the Texas League Champion RockHounds…played for Mesa in the Arizona Fall League following the season and batted .270 with no home runs and seven RBI in 21 games. Played in a career-high 136 games between Beloit (A) and Stockton (A) ... Named as a Midwest League Mid-Season All-Star. Played as a defensive replacement for the West Club and was 0-for-1 in the game ... Posted career highs in at-bats (519), runs (69), hits (135), doubles (26), triples (3), home runs (13), RBI (74), walks (33) and strikeouts (82) ... Ranked among Athletics minor leaguers in RBI (74, 5th), hits (135, 7th), total bases (206, 8th), runs (69, T8th) and home runs (13, T8th) ... Rated as the No. 10 prospect in the Athletics organization by Baseball America. Hit first professional home run at AZL Brewers (7/13) off Josh Uhen, a three-run shot. Played 32 games his first professional season in the Dominican Summer League starting 22 games at shortstop while ranking second on the team with 22 RBI. April 16, 2019 St. Louis Cardinals recalled SS Yairo Munoz from Memphis Redbirds. April 15, 2019 St. Louis Cardinals optioned SS Yairo Munoz to Memphis Redbirds. April 13, 2019 St. Louis Cardinals recalled Yairo Munoz from Memphis Redbirds. April 7, 2019 St. Louis Cardinals optioned SS Yairo Munoz to Memphis Redbirds. December 4, 2018 Toros del Este placed SS Yairo Munoz on the reserve list. August 22, 2018 Yairo Munoz roster status changed by St. Louis Cardinals. August 18, 2018 St. Louis Cardinals sent SS Yairo Munoz on a rehab assignment to Springfield Cardinals. August 11, 2018 St. Louis Cardinals placed SS Yairo Munoz on the 10-day disabled list. Right wrist strain. May 18, 2018 St. Louis Cardinals recalled SS Yairo Munoz from Memphis Redbirds. April 16, 2018 St. Louis Cardinals optioned SS Yairo Munoz to Memphis Redbirds. October 2, 2017 Oakland Athletics recalled SS Yairo Munoz from Nashville Sounds. June 24, 2017 SS Yairo Munoz assigned to Nashville Sounds from Midland RockHounds. May 3, 2017 Midland RockHounds activated SS Yairo Munoz from the 7-day disabled list. April 4, 2017 SS Yairo Munoz assigned to Midland RockHounds from Nashville Sounds. March 13, 2017 Oakland Athletics optioned SS Yairo Munoz to Nashville Sounds. November 21, 2016 SS Yairo Munoz assigned to Toros del Este. November 18, 2016 Oakland Athletics selected the contract of SS Yairo Munoz from Midland RockHounds. October 8, 2016 Mesa Solar Sox placed SS Yairo Munoz on the reserve list. April 26, 2016 SS Yairo Munoz assigned to Midland RockHounds from Stockton Ports. April 7, 2016 SS Yairo Munoz assigned to Stockton Ports from Midland RockHounds. September 12, 2015 SS Yairo Munoz assigned to Midland RockHounds from Stockton Ports. July 27, 2015 SS Yairo Munoz assigned to Stockton Ports from Beloit Snappers. April 6, 2015 SS Yairo Munoz assigned to Beloit Snappers from Vermont Lake Monsters. April 1, 2015 SS Yairo Munoz assigned to Oakland Athletics. June 11, 2014 SS Yairo Munoz assigned to Vermont Lake Monsters from AZL Athletics. June 1, 2013 SS Yairo Munoz assigned to AZL Athletics from DSL Athletics. June 1, 2012 Yairo Munoz assigned to DSL Athletics. January 27, 2012 Oakland Athletics signed free agent SS Yairo Munoz to a minor league contract.